After owning various 10-15 year old econoboxes (celica, saturn, civic) the past 15 years, and looking into a "fun" daily driver the past year, I finally pulled the trigger. Has 83K on the clock and I'm the third owner. The second owner (male, early 60s) had her for 12 years, kept her garaged and has copious maintenance records for her including IMS/clutch/flywheel less than 2K ago. 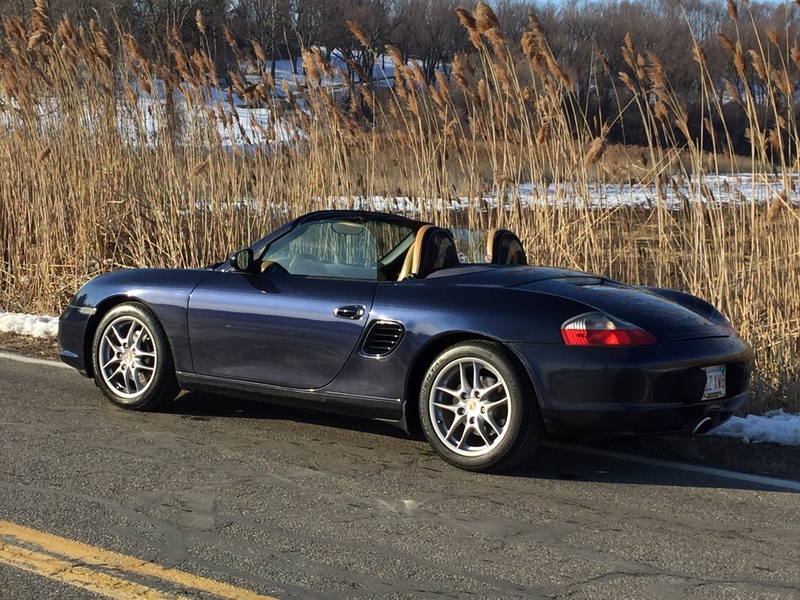 This became the owner's garage queen, with less than 700mi put on her in the past 2 years. I've already put about 300 in a week. I did NOT get a PPI. I bought it from out of town, and the only german shop in that town is where all the maintenance was done at. I had the chance to speak with the owner of the shop briefly on the phone, and he kind of just confirmed what I saw on the maintenance records and stated for PPI they'd likely just hook it up to the computer and do a visual, then go from there. I have an porsche/mb indy shop near me that gets really good reviews. I plan on doing whatever maintenance I can myself, despite living in an apartment complex. I know I want the motor oil and brake fluid changed, and am debating whether to just do it myself next weekend or take it in to the indy and have them inspect the vehicle while its in. I'm in Sacramento, CA, in case there are any others out this way! I'd take it in for an inspection. At least pay for it to prepare yourself for what repairs haven't been made that you'll need to eventually. Learn how to change the oil yourself. To keep the car healthy, it's recommended to change it every 5,000 miles with a high quality synthetic. If you search the forum there are numerous opinions on which oil is best to use. My advice is not to ask here. Search read and make up your own mind. You can save a lot of money changing the oil yourself if your apartment complex allows you to do your own maintenance. Welcome to the forum and porsche world. It's always recommended that you join your local pca chapter and get involved with the pca community. Great group and great club. Enjoy the car and drive it like you stole it! Last edited by jdraupp; 02-07-2016 at 08:34 AM. 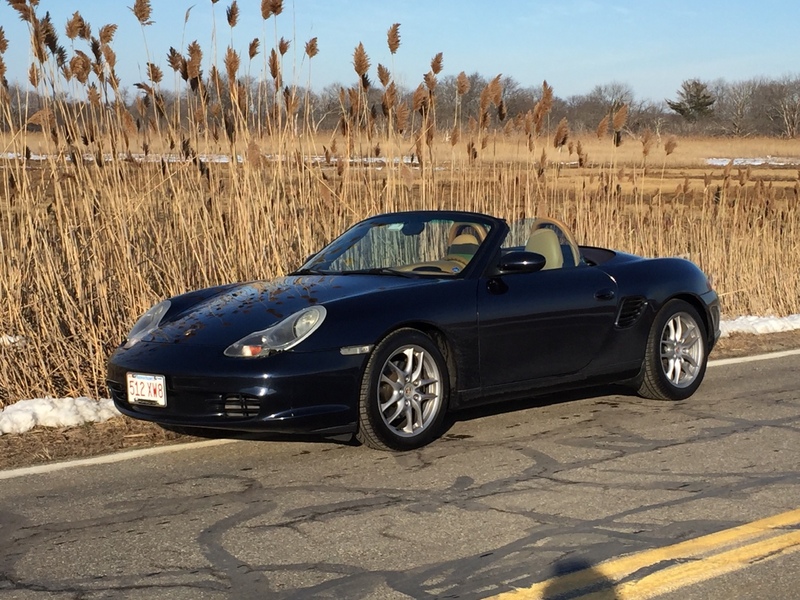 Nice looking Boxster! Looks like Lapis blue paint with grey and black interior, metropol blue top, 18" turbo look wheels. Good to see you driving it too. I hate to see good cars being garaged all their lives, does the car no good at all. Beautiful car, hope you're happy with it! Is it a 2.5 or a 2.7? 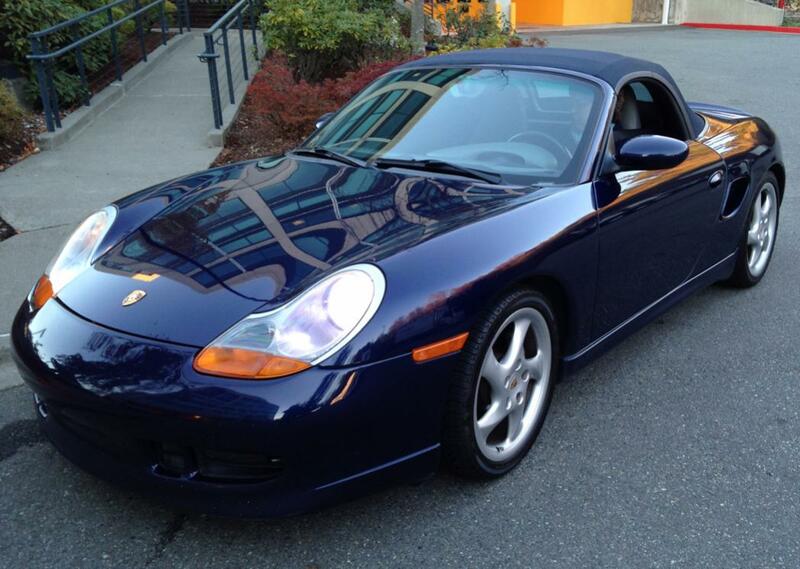 I think this is the first time I've seen those rims on a blue boxster. It looks outstanding! The paint code was L3A8 E3 for those wondering. Brand new top placed on it less than 3Y/6K ago with the glass defrosting window! If we're counting strictly work, I'll be putting about 14K on it per year. Plus whatever roadtrips we'll do. It's definitely not the fastest car out there, especially by today's standards, but it has double what my civic had, and is just a thrill to drive! Tailpipe smoked a lot when I first started it up on the first test drive, but haven't really noticed an issue since, and no suction of the oil cap when I had her running earlier. There is an 2 day (2 consecutive saturdays) porsche dealer sponsored autox school in a month coming up. Will try to see if I can make that! Sweet! Welcome to the forum. 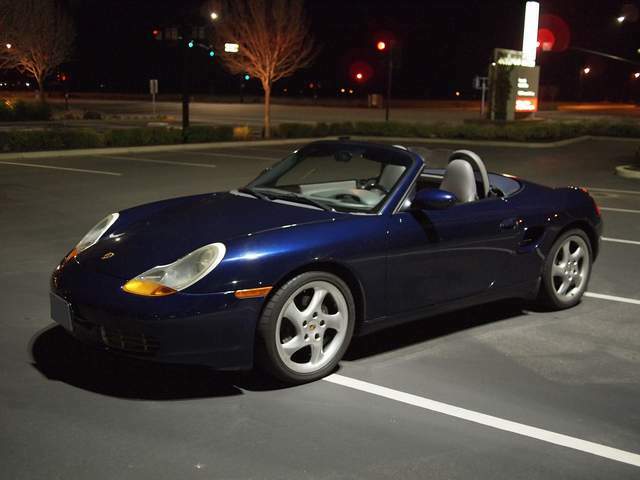 Blue Boxsters are the best. And' yes, I am biased! Today, north of Boston, about 45F. Forecasting 8-12" of snow tomorrow, so I flung that window of opportunity wide open and put 50 miles on her. ......I hope my clear corner trims arrive! Scheduled for tomorrow. A little hard to see, but just installed my clear (with red LED) third brake light too! It is normal for these cars to smoke a bit on start up especially if it has not been run for a while or if it was recently run for a very short period of time. Nothing to worry about unless it keeps smoking. If you want to do simple maintenance at a parking space, I'd highly recommend Rhino ramps or similar as an easy to use and easy to store way to raise up the car. Congrats! It looks like you got a nice one. Mine might very well be the identical counterpart to yours (except for having an aerokit and a few more miles). .....and sorry to seem like I tried to steal your thunder, asteroid I guess I just get excited about the blue cars! Beautiful cars! Just bought some carwash for it (Optimum no rinse wash and wax) so will hopefully get her shining again! thanks for the tip about the ramps. How hard is it to get under to change the oil with a 6.5" high drain pan, without a lift? With ramps like in the picture above? Pretty easy. I have done mine that way a couple of times. I like to have the car as level as possible because it helps me feel like I am getting more of the old oil out My driveway slopes down just a little bit so I back the car down the slope and up onto the ramps which levels the car, and there is plenty of room to change the oil.